Not to be negative, but sometimes cashiers can ruin a coupon trip. They are just doing their job, but some are a little more uptight about coupons than others. The biggest frustration for me, is that most stores seem to not educate their cashiers on coupon rules. As couponers, we often are worried about how all our coupons will go through at checkout. If you've ever planned for a “coupon haul” or even a small shopping trip with coupons, you have most likely thought, “I hope I pick a good cashier!” (aka, cashier profiling 🙂 I pick the young teenage boys if possible, because they don't care. LOL! The last thing you want is for all your hard work to go to waste and to have your coupons not go through. 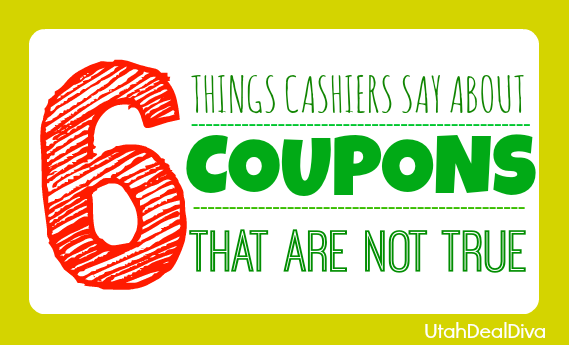 Here are some common misconceptions about coupons I have personally heard from cashiers. Hopefully this will help you when you are at the register and get faced with these problems. Myth #1: You can't use this coupon on “that” product because it doesn't match the picture on the coupon. The truth: When using a coupon, you always match it to the description, not the picture. If a coupon says it can be used on “any product”, but then shows a picture of a specific variety of that product, it can still be used on any product of that brand, not just the one shown. When using coupons, make sure to read the description and the fine print. Don't just go off the picture. For example, look at the Curad coupon below. It states $0.50 off ANY Curad product, then shows a certain variety of bandaids. This coupon can be used for any Curad product, even Curad hydrogen peroxide, even though it is not shown. Myth #2: You can't use this coupon because it says “Walmart” on it. The truth: A lot of coupons printed off of coupons.com have an “Available at Walmart” or another retailer like CVS, Dollar General, etc., printed on them. It is merely the retailers HOPE that you will use that coupon at their store. If it is indeed, a manufacturer's coupon, you can use it at any store that accepts coupons. Smith's even sends out coupons that have the “Smith's” logo on them, but are manufacturer coupons. These can be used at any store. Remember, if it says “store coupon”, or “ONLY redeemable at” then it can only be used at the specific retailer. The truth: Let me first just say, I had this exact thing said to me just yesterday. Most stores barely train their cashiers on coupons, so a lot of them think if printed coupons have the same barcode number on multiple coupons, they must have been copied. We all know copying coupons is a big NO, NO, so of course they aren't copied, right?! What cashiers fail to notice is that ALL like coupons have the same barcode number, even newspaper coupons that come from Smartsource and Red Plum, etc. That barcode number cashiers are talking about is the same on all like coupons, just like a UPC is the same on all products that are the same. Cashiers need to know to look at the unique number sequence that is printed in the upper right hand corner of printed coupons. This is what gives them their unique-ness. Sometimes there are 3 different barcodes on printed coupons, so be aware of which one is which. See the below image. The barcode circled that says “unique barcode” is a number that will be different on every coupon if it is printed in accordance with the ”2 per computer” rule and not copied. Myth #4: You can't use this coupon because it exceeds the price of the product. The truth: As couponers, we've all heard this. Am I right? Well as we know, coupons can be adjusted down. So if you have a $4.00 off coupon for any Almay makeup, and the Almay eyeshadow you are buying is only $3.49, the cashier can adjust the coupon down to $3.49 instead of $4.00. Most stores don't allow “overage”, so the coupon needs to be adjusted down. Walmart is one exception because they allow overage and will give cash back for the remaining balance of your coupon if it exceeds the price of the product. Myth #5: You can't use a coupon on this clearance item because the store will lose money. The truth: One big misconception about coupons is that the store is losing out on money when consumers use them. In some cases it may be true for store coupons, but it is definitely not true at all for manufacturer's coupons. The store gets reimbursed the full value of coupon from the manufacturer of the product, plus some, to help the store be able to more than cover the cost for postage. Not only is the coupon benefiting them, but they are making a little bit of money on it. So as for clearance, a store will get reimbursed the value of the coupon just the same–even on a clearance item. And as said in #4, the coupon can be adjusted down, if needed. One thing to remember is to always use coupons in accordance with what they are intended for. If you knowingly use a coupon that is wrong, or expired, the store does not get reimbursed. This is considered fraud. We all need to keep our coupon ethics high, so manufacturer's will continue to provide them to us! Myth #6: You can't combine a store and manufacturer coupon because that is considered double couponing. The truth: You will never hear this from a cashier at Target, but as for other stores that aren't as accustomed to customers combining store and manufacturer coupons on a regular basis, you may hear this. 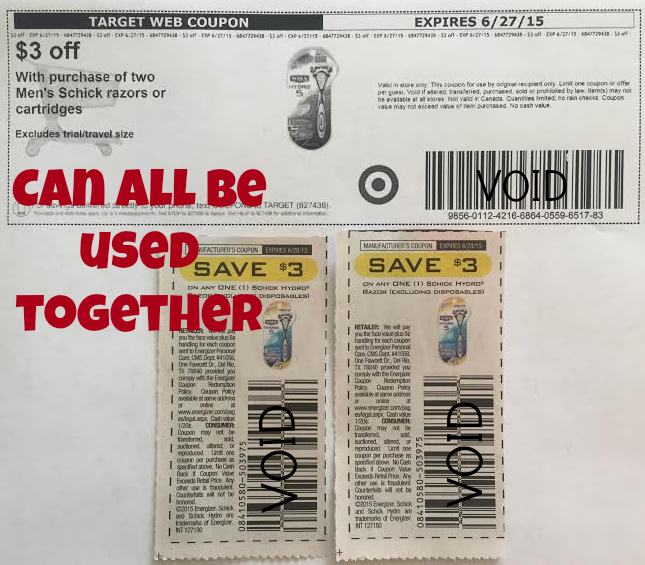 In most all cases, you can combine a store and manufacturer coupon on the same item. A store or “vendor” coupon is like having a sale on that item, but just in paper form. And you can use manufacturer coupons on sale items, right? Of course! So combining a store and MQ is just the same. Some very select stores may not allow this, so ask beforehand at your store if you are wondering. I have personally combined store and MQ's at Target, Smith's, Rite Aid, Walgreens, CVS, Whole Foods, Dollar General, and Winco. The example below shows a $3 off 2 Men's Schick Razor TARGET coupon, and (2) $3 off 1 Men's Schick Razor Manufacturer coupons. If you buy 2 Men's Schick razors, you can use all three coupons. The intent of this article is not to put down cashiers. I know they are just doing their job the best they know how. I just simply wanted to write this, so that all of you that are new to couponing may know the answer to common cashier misconceptions, if you are ever faced with these issues at the checkout! If you ever do have these problems, always be courteous and tell the cashiers what you know. Explain why the coupon should work, and be sure you know it will. 😉 If you really have a problem with your coupons, you can always just say you don't want to buy the product and try it another time. Hope this helps! This entry was posted in Coupon Basics. Bookmark the permalink. Stock-Up Price on Scott Extra Soft, Delivered to Your Door! I love these MEGA rolls! It definitely helps! Thank you! I haven't run into any of these issues yet but I'm sure I will. Cool, I needed to read this before I ventured out. My local Walmart and Dollar Tree always stop me at Myth 1. At my Smiths I keep running into Myth 4 by several cashiers. My coupon is 3.00 and the item is 2.99, they wouldn’t accept it over a penny. I was even told by two cashiers it was their new policy. Young teenage boys cashiers are the best lol!! You are soooo right, the older ladies (not all of them) make you feel like every time you use coupons you are taking money out of their paychecks, makes me so mad ? Boutique Baby Blankets 75% off!